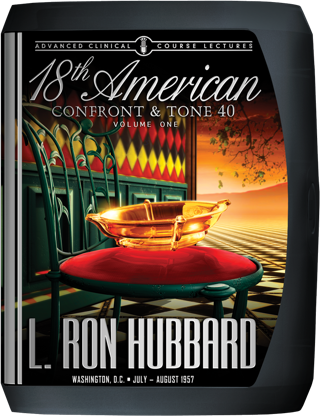 With CCH, L. Ron Hubbard had the means for auditors to crack even the “toughest” cases. Although the processes demanded the stamina and skill of an auditor at Tone 40—a level at which only Clears and OTs qualified—Mr. 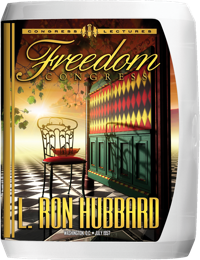 Hubbard had already released the solution at the Freedom Congress, where he demonstrated it by coaching Upper Indoctrination Training Drills (TRs). And in the 18th ACC, he then put these new techniques in the hands of auditors. Given that the essence of TRs is the ability to perceive, he set course with his classic statement on confronting—Scientology & Effective Knowledge. Then, ACC students literally pioneered the bedrock of future training. With TRs as a vital undercut to processes, Mr. Hubbard taught a battery of related discoveries: the definition and application of necessity level; the use of Informal Auditing, Formal Auditing and Tone 40 Auditing; the relationship of the Effect Scale to Tone Scale level and the long‑sought answers to one of Man’s oldest mysteries—death. Here, then, is the full technical application of the revolutionary breakthrough that not only changed Academies forever, but provided Man with his first workable technology on how to confront. As to what that meant in terms of broad scale clearing, Mr. Hubbard emphasized that better than 50 percent of those results depended upon the ability of the auditor. And that was most specifically true in the case of CCH, wherein the very power of the processes had brought a new challenge: it severely tested an auditor’s stamina and skills. In point of fact, he had discovered that the effectiveness of CCH depended to a very large degree on auditor state of case and tone level. Indeed, effectiveness of CCH required an auditor at Tone 40. Thus existed an apparently insurmountable obstacle: For when it came to Tone 40, one was only looking at Clears and Operating Thetans. And with a need for thousands of auditors—right now—to begin planetary clearing, time did not permit every auditor attaining Clear before running others on these processes. Yet if that had been the state of affairs, L. Ron Hubbard had arrived at the solution and announced the breakthrough at the Freedom Congress, so named both because it opened on America’s Independence Day, 4 July 1957, and additionally marked the release of new technologies to free every being on Earth. And whereas that Congress had featured an instructive—and unforgettable—demonstration of training routines and Upper Indoc, Mr. Hubbard was about to put these new techniques to the test of full workability in the training of auditors at the 18th American Advanced Clinical Course. “Most of our data is on the firm foundation of having looked. Thus the course of the 18th ACC. Yet those students may not have realized what they were in fact pioneering under Mr. Hubbard’s direction was the bedrock of future auditor training. For all that they learned and applied was to form the cornerstone of the Professional TRs known and used today by auditors from Sydney to Miami to Budapest. Groups—instruction on how to handle people and groups and help auditors in the field accomplish their local plans for expansion. “We have, as any student can tell you, finalized training patterns. We know today how to train as never before. “The art of training is to preserve the will while communicating the subject. Today we can do just that—and even improve the will. “As the old schools of psychology and psychiatry and the ministry die out and our new abilities move in, the world changes. Steadily and calmly we are taking over more and more territory that was once the ‘only one’ domain of the head shrinkers and brain embalmers. And if it is true that auditor training would never be the same again, L. Ron Hubbard was already advancing into the next great phase of research, this time to move Scientology three feet behind society’s head with a monitoring datum that would henceforth guide all planetary clearing.